Teni The Entertainer on Thursday announced her upcoming global tour, which will see her perform at 20 cities around the world. The tomboyish singer had a good 2018, a year which she won several awards and increased her fan base. She also released hit singles such as ‘Wait’, ‘Askamaya’, ‘Case’ and most recently, ‘Uyomeyo’. The forthcoming tour, tagged ‘Teni Live’, is being put together by Dr Dolor Entertainment and Doble Seis Entertainment. The award-winning Nigerian songwriter, singer and social media sensation will be performing in 20 cities in nine countries across three continents. The tour will kick off February 15 in the UK in cities like Birmingham, Manchester and London. She will then proceed to the rest of Europe in March to entertain fans in Cyprus, Romania, Turkey, Poland, Bulgaria and Belgium. 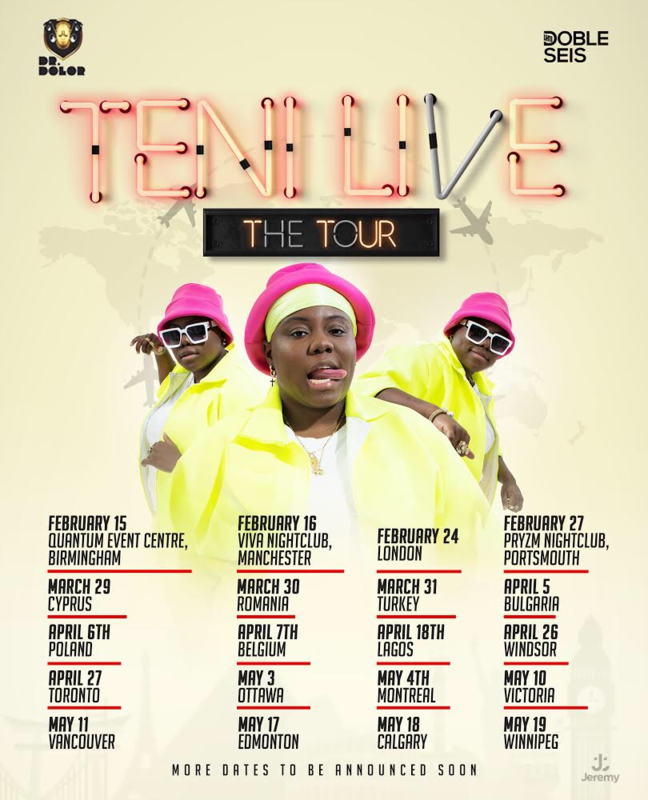 Teni will return to Nigeria in April 18 for her Lagos show before ending the tour in Canada, starting with Windsor on April 26 and then Ottawa, Toronto, Montreal, Calgary, Winnipeg and more. Apata Teniola, professionally known as Teni, is a graduate of business administration from the American Intercontinental University, Atlanta. Teni launched her professional music career in 2017 after Fargin, a product of one of her numerous social media freestyles, went viral. At the end of 2018, Nigerian music fans voted her the second best artiste of the year, coming behind Burna Boy. Lagos – Teni Live, GidiFest.